Omnilux™ was created as a result of over 12 years of extensive medical research at the UK Cancer Research Institute and Christie Hospital. Omnilux™ is a new technology based on narrowband Light Emitting Diodes (LEDs). Stimulates the bodies own cellular mechanisms by photo-modulation. Treats all skin types and colours. No damage to sub-dermal tissue. Compatible with existing skin rejuvenation techniques such as microdermabrasion, acid peels, IPL and other procedures. Allows treatment of large areas such as the face, chest or back. A combination of methods - a series of Lege Artis Signature Deep Cleansing Facial with Omnilux™ Light Therapy in acne-prone skin. 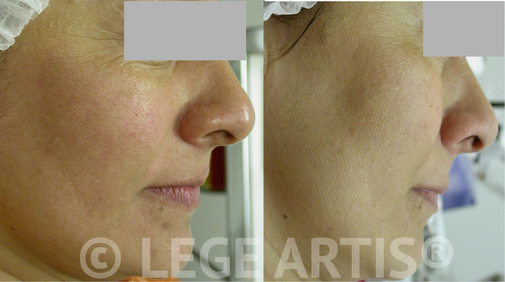 A combination of series of Clinical Peels with Omnilux™ Light Therapy (Revive™ and Plus™) was effective for this client with diffuse pigmentation, skin redness and periorbital wrinkles. Omnilux Blue™ (415 nm) has been specifically developed to target the naturally occurring photo-sensitizer, Coproporphyrin III, found in P.acnes bacteria. Activation of coproporphyrin III creates intracellular singlet oxygen - inducing complete bacterial death that leads to rapid eradication of the P.acnes bacteria. Omnilux Revive™ (633 nm) can be used for skin rejuvenation alone or in combination with Omnilux Blue™ for acne or in combination with Omnilux Plus™ for wound healing and scar treatment. Omnilux Revive™ is proven to stimulate cellular mechanisms responsible for tissue repair and regeneration as well as collagen production. In clinical trials clients reported an overall lifting and hydrating effect, an improvement in skin tone and texture, an evening out of pigmentation and, in many cases, a smoothening effect on fine lines and wrinkles. Omnilux Plus™ (830 nm) is used for the purpose of skin rejuvenation in combination with Omnilux Revive™ and also for wound healing and scar treatment. A combination of Omnilux Revive™ and Omnilux Plus™ is used to stimulate deep skin tissue leading to softening of fine lines, improved skin tone and super smooth skin. The treatment promotes clearer, brighter and smoother complexion. After the course of treatments is finished, clients still see continuous improvement in tone and clarity as well as softening of fine lines and wrinkles. 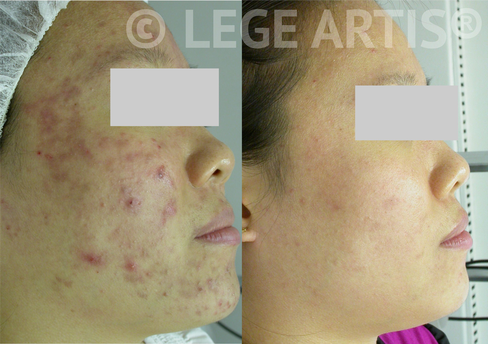 ﻿Omnilux Acne Clearance protocol consists of 8 sessions over 4 week period. Omnilux Blue™ is either used alone, or combined with either Omnilux Revive™ or Omnilux Plus™. Omnilux™ combination light therapy works through the antibacterial and anti-inflammatory properties of blue and red light. In prominent clinical study, after 8 treatments, subjects saw an 81% reduction in acne lesions. The use of Omnilux™ Light Therapy offers excellent efficacy in redness reduction and overall facial cosmetic enhancement. In addition, the anti-inflammatory effects of the Omnilux Revive™ treatments act to prolong time-to-recurrence of the condition. The treatment course is typically 3 treatments weekly for 3 weeks, 9 light treatments in total. Cell activation tests show that Omnilux Revive™ and Omnilux Plus™ have specific and unique cell stimulation patterns acting to photobiomodulate cell function and rejuvenate the skin. Omnilux Plus™ 830 nm light acts synergistically with Revive™ light to achieve optimum efficacy in photorejuvenation. Omnilux Plus™ is strongly absorbed within fibro-myocytes promoting alignment and increased tone in the newly produced collagen bundles. The composite effect leaves the skin fuller and tighter in appearance. Light stimulated neovascularization in the treatment area means greater perfusion to the skin, increased oxygenation and removal of toxins and a more glowing appearance. The recommended treatment protocol consists of 7 sessions over 5 weeks.